Bhav Samadhi Training 2 is a 4-days residential programme offered to those SSY meditators who have undergone BST1 and have realised the immense power of living in Truth. 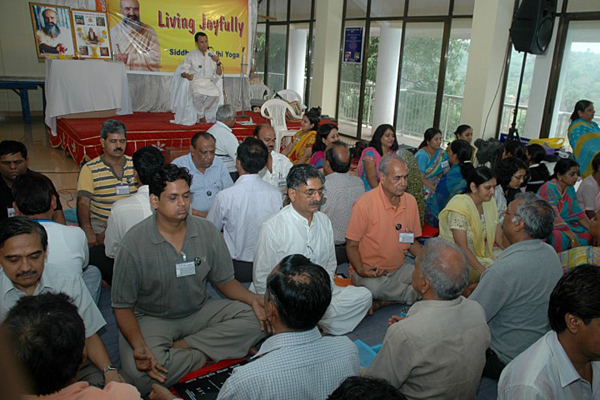 Bhav Samadhi Training 2 (BST2) is a training in dharma. It is a training designed to realise that every truth has an equally valid opposite truth. It is a programme of realisation of godliness in others through the medium of dharma. Here dharma is not limited to religion but encompasses one's duties and obligations towards each other and the society. It offers a great amount of introspection and challenges the conviction ‘I am right and others are wrong’, which is what we call as self-righteousness. It releases one from all the bitterness one might be carrying towards anybody in this world. It blows your spirited action borne from for self-righteous truth to pieces. Truth without love has hidden untruth. Here, you realise your responsibilities in a deeper and truer sense. No one can disturb the peace of mind and the universal love of someone who has imbibed the teachings of BST2. The programme brings about betterment in relationships; many families going through difficulties in relationships have successfully come together after undergoing BST2.